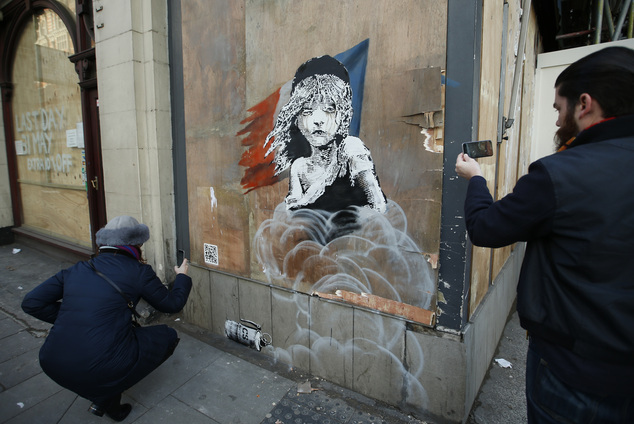 Banksy’s newest piece of street art has caught my attention twice this week – first for the work of art itself, and the powerful way that it incorporates digital media, and second for the clearing away of the work, and the way it’s being saved for the public digitally. So let’s start with the work of art itself. It turned up last Saturday across the street from the French Embassy in Knightsbridge. At its centre is the iconic illustration of Cosette from Les Miserables, but with yellowy tears running from her eyes, and gas from a nearby canister clouding her body. Most have read it as a critique of the French government’s use of tear gas in refugee encampments in Calais. This isn’t the first time Banksy has used his work to speak out against the treatment of immigrants and the dangers of xenophobia – for other examples see here and here. It is the first time, though, that he’s included a piece of digital technology that invites viewers to take his image a step further, and to have a look for themselves at the media footage he’s responding to. That’s right, a QR code. One of those black and white little squares that you really only see in marketing materials these days. In his book The Emergence of the Digital Humanities, Steven E. Jones takes a swipe at these pieces of low-fi, quasi-digital kit, largely for their ineffectiveness (who actually takes the time to scan them?) but also for their feeble and rather outdated gesture towards some other dimension known as ‘The Digital’. I pretty much agree – I downloaded a QR reader to my phone a few years ago when we got an app-based walking tour in Stratford, but it never really worked that well, and eventually I deleted it in order to make space for something else. But Banksy’s use of the QR code really caught my eye, and got me thinking about how it really can work, provided that the thing it connects you with is something genuinely interesting, useful, unexpected, and important. 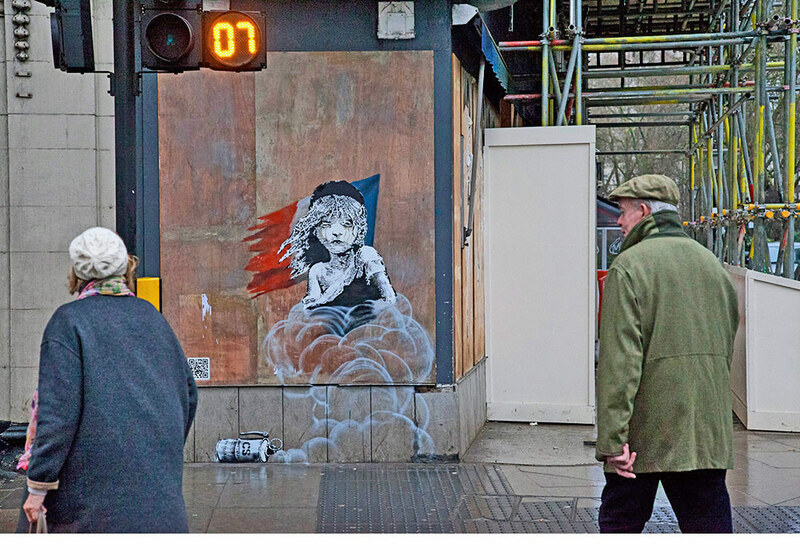 As the video above shows, Banksy’s QR code links the viewer to media footage of the very event he is critiquing, and in doing so it layers art with reality, painting with video, street art with newsfeed. It is multimedial and multiexperiential, inviting us not only to revel in his satirical comment, but also to witness a few, harrowing minutes in the lives of people just 100 miles away from London. In a strange way, Banksy’s painting makes this live footage become ‘real’, rather than the other way around. By inserting it into the well-heeled streets of Knightsbridge, by giving it context outside of the numbing repetitiveness of the nightly news, by making it a part of a conversation, it focuses viewers’ attention and creates new impact. It’s interesting too that the best video documentation of the painting that I’ve found – the piece embedded above – was created specifically for Facebook by the social media outlet AJ+, and doesn’t exist separately as an independent URL. It’s meant to be shared, and unlike the versions that I found on more traditional news sites, it actually mixes in the video footage opened up by the QR code. Plus, it forgoes the heavy, didactic narration of the news presenter and chooses instead to frame the piece through music and single lines of written text. The effect, for me, is far more engaging, exploratory, immersive, and powerful. Now, the coda – like so many Banksy pieces these days, this one has already come down (or at least part of it – while the bulk of the image was painted on a piece of easily removed plywood, the tear gas can is on the base of a stone wall). Given the price that Banksy’s works now go for, it wouldn’t surprise me at all if it makes its way into a private collection. But before the removal occurred, a man from Google came with the company’s Streetview kit to digitally record and document it. In a few months, and certainly a few years, this may very well be the only high-quality, officially archived ‘copy’ of the work available to the public. So what started off as a mixed media piece on the streets of London might ultimately end up as an entirely digital one in the clouds of the internet, increasingly managed by the empire of Google. The British Milton Seminar meets twice yearly to discuss papers on subjects relating to John Milton's life, work and times, together with his legacy and influence. The seminar is open to academic and academic-related staff and to postgraduate students.